The Discovery Point Club is a beautifully maintained resort that has been awarded a Superior rating by the Cayman Department of Tourism. 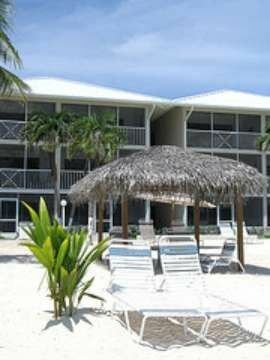 The resort is located on the western end of World Famous Seven Mile Beach on the island of Grand Cayman. Grand Cayman is the largest of the three British-owned islands in the Western Caribbean Sea and is world renowned for it's amazing beaches, unbelievable scuba diving, snorkeling and deep sea fishing. Come enjoy this wonderful Caribbean Island Paradise in our first floor, beach and ocean front condominium. Our screened-porch is less than 150 feet from the water; which averages 80+ degrees almost year round. The weather temperature averages 80s by day and 70s by night. Our unit is 1 of 45 Condos in the resort and offers two fully equipped bedrooms, two baths and a fully equipped and updated kitchen. One bedroom has a king bed, the second bedroom has two twin beds that can be converted into a king bed, and there is a queen hide-a-bed in the living room for extra guests. The entire Condo can accommodate six people easily. This Condo is our home and is decorated as such; not decorated as a rental property. There are tile floors, Corian counter tops, stainless steel appliances plus quality furniture and accessories decorated with a sense of true island style. The 12 foot sliding glass door opens onto a screened-in porch which overlooks world famous Seven Mile Beach and gives you a 'picture perfect' view of the ocean 24 hours a day. Walk outside and you will already be on the beach! Great for watching the sun set or the moon rise! Also great for star gazers! In addition, there is a new swimming pool and jacuzzi, both ocean side, for the exclusive use of you and your guests 24 hours a day. Two tennis courts, a basketball hoop and numerous BBQ grills are also available for use on the resort grounds. Daily maid service, broadband internet connection, beach and bathroom towels, satellite television and modern stereo system are provided for your use and entertainment at no additional fee. A telephone is available for you to make local calls as needed. Long distance/International calls can be made, but only at the Renter's expense. Just minutes from downtown Georgetown and Owen Roberts International Airport. Located directly on World Famous Seven Mile Beach just steps from the beach / Ocean front.